As we proceed into the decade of cell therapy, we now recognize the critical need for the time management of cellular products. Many processes aimed at developing a cell therapy product are vastly different but all require preservation as an enabling element in production, storage, and distribution. Today’s preservation processes are widely recognized as suboptimal and have remained relatively unchanged over the past few decades. Many of us who work with preserved cells [either hypothermic (4–10ºC) or cryo-preserved (-196ºC)] recognize that Trypan Blue, for instance, often overestimates cell survival and has no relationship to cell function. Yet Trypan Blue assessment immediately poststorage remains today’s gold standard despite its inaccuracies. The intent of this article is to outline a four-tier assay strategy that may serve as a framework for discussions on developing a standardized set of viability and functionality assays for post-preservation cell assessment. Historically, viability assays centered on the simple assessment of the loss of cell membrane integrity. The 51Chromium release assay was one of the first to appear in the literature and was extensively used between 1970–1990. This assay, along with the lesser-used 14Sucrose release assay, relied on radioactive isotopes which made it less attractive than alternative nonradioactive approaches. The LDH (lactate dehydrogenase) release assay replaced the 51Chromium release given that it is non-radioactive. Another cell membrane integrity assay, the Trypan Blue exclusion test, appeared soon thereafter and rapidly became the standard used to assess cell viability. The 1980s heralded a revolution in our ability to assess cell viability and function with the introduction of fluorescent probes to monitor a wide range of physiological parameters. Molecular Probes (www. probes.invitrogen.com) recognized that probes could be synthesized, which might have utility in analyzing a number of important cell viability and function endpoints. At about the same time, Millipore (www.millipore.com) developed one of the first bottom-reading spectrofluorometers, the CytoFluor, that allowed for the analysis of fluorescence in situ in cells in multi-well plates. The combination of the spectrofluorometer and an increasing portfolio of fluorescent probes led to multiple endpoint fluorescence assay development—sets of fluorescence probes that could monitor multiple physiological parameters often simultaneously in the same cell culture using a single instrument. 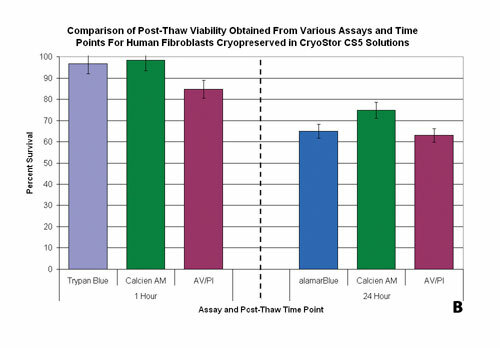 With the current availability of nearly 100 different cell viability/function assays able to identify changes in a wide spectrum of physiological parameters, we may now ask: How can we standardize cell viability and function assays to assess postcryopreservation and hypothermic storage efficacy? A first step toward answering this question is to propose a four-tier set of assays that encompasses membrane integrity, molecular mechanisms, cell function, and biochemical alterations as a framework for standardization in support of uniformity and predictability of the individual therapy in development. Tier 1 Assays are often referred to as live/dead assays. These are single endpoint tests that are limited primarily to measuring cell membrane integrity. Calcein-AM, for instance, is membrane soluble but once inside the cell, the AM group is cleaved by cellular esterases trapping the Calcein in the cell. A loss of cell membrane integrity allows the cleaved Calcein to leak from the cell into the surrounding medium leaving only the intact viable cells to fluoresce green. 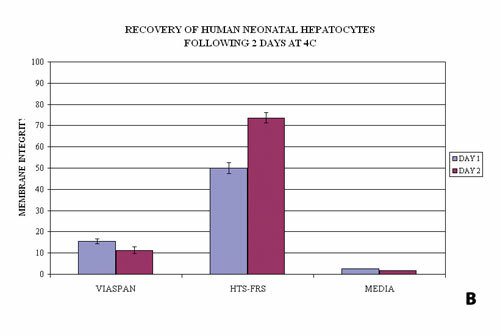 Examples of the utility of this probe are illustrated in Figures 1A and 1B where primary human hepatocytes were stored at 4ºC for two days (a storage procedure that mimicked a two-day shipping event) in various preservation media (UW/ViaSpan: Barr Laboratories; HTS-Base and HTS-FRS: BioLife Solutions; Media: various sources) and then assayed using Calcein-AM. Both the photomicrographic images (Figure 1A) and the spectrofluorometric data (Figure 1B) corroborate the differences in cell numbers based on measuring membrane integrity between the sample sets. It should be noted that there are a variety of membrane integrity fluorescent probes that include Propidium Iodide, BCECF-AM, and others. Calcein-AM, however, demonstrates the highest signal-to-noise ratio, is least affected by differences in intracellular pH, and in the case of hepatocytes, is not chemically altered due to the cytochrome p450 enzymes in these cells. Tier 2 Assays focus on specific molecular mechanisms that underlie the loss of cell viability and function following preservation. These events primarily precede the Tier 1 event of membrane lysis, and the assay choice is somewhat dependent on the nature of the analytical question being posed. For example, if stem cells shipped to the end user are compromised during transport, it is important to determine what stress mechanisms were activated. One of the first steps is to determine which subpopulations of cells remain alive and which might be in the early stages of apoptotic or necrotic cell death. This question defines a select set of apoptosis or necrosis fluorescence assays that can be employed. One method of assessing apoptosis and necrosis is the Annexin V/PI assay (Green, 2002). If the primary mode of death is apoptosis, then the caspases (cell death proteases) that are activated can be identified using a variety of fluorescence assays. Another line of assessment may rely on JC-1—an in situ fluorescent dye that can both qualitatively and quantitatively monitor mitochondrial activity. While the Annexin V/PI assay provides for a more detailed understanding of the various subpopulations of cells, there is also a series of Tier 2 assays that allow for one to focus on the living subpopulation of cells based on metabolic activity. A prime candidate for this type of assessment is a noninvasive metabolic indicator such as alamarBlue®. This assay reportedly can be used repeatedly on the same cultures for several weeks to monitor cell viability for an extended period after a bioprocessing event. 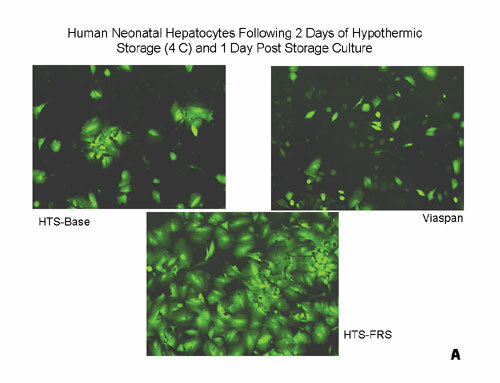 In the case of stem cell preservation, the loss of cell viability due to storage in suboptimal shipping solutions may not be manifested until one or two days subsequent to transplant—a fact not often appreciated as a process-related variable. 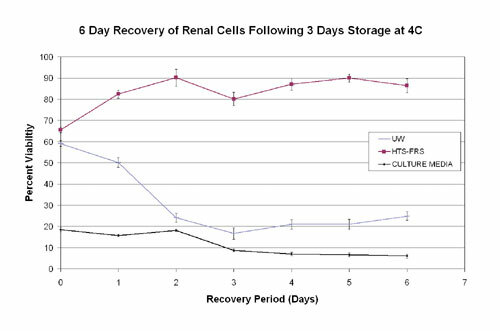 An example of this time-dependent, delayed onset cell-death phenomenon can be observed in renal cells subjected to three days of hypothermic exposure, warmed to 37°C, then assayed with alamarBlue for seven consecutive days (Figure 2). In this example, cells stored in an optimized preservation solution (HTS-FRS) maintain their viability and propagate as reflected by an increase in alamarBlue fluorescence. Note, however, that cells stored in a suboptimal solution (i.e.,ViaSpan®) appear viable when initially re-warmed (Day 0) but viability declines throughout the assay period. Thus, if only a Tier 1 assay, such as Calcein-AM, had been used at a single time point, the time-dependent differences in the sample survival would not be noted. As such, one might conclude that the various samples were similar when, in fact, they were not. Given this observation, one can see how important it is to test stepwise the entire bioprocessing protocol. Tier 3 Assays focus on cell-specific function. Data accumulated over several years from numerous studies demonstrate that a loss of function is not coincident with a loss of viability. For example, preserved hepatocytes can appear perfectly viable as determined by Tier 1 and 2 assays, yet the cell function (cytochrome p450, urea production, etc.) can be seriously deficient. Recent studies have also demonstrated that cryopreservation can significantly alter CD34+ expression and clonogenic capacity of umbilical cord blood stem cells. Yet by using advanced preservation media, this negative impact can be significantly reduced. A plethora of well-documented studies in other cell systems, including PBMC, stem cells, and hybridomas, demonstrate this loss of function following classic preservation regimes. The diversity in functional assays can be illustrated in a variety of cell types. For hepatocytes, there are dozens of assays that have been used to measure functionality with little consensus on which are most important. For pancreatic islets the glucose stimulation assay is now informally accepted as the key functional assay whereas for cardiomyocytes a simple, spontaneous contraction assay might be accepted as the functional assay. Yet it remains unclear with other cell types which cell function assays should be regarded as standards. Thus, in contrast to Tier 1 and Tier 2 where Calcein-AM and alamarBlue assays may be applied as standard assays, Tier 3 assays clearly need to be cell type specific. Tier 4 Assays focus both on proteomics and genomics as an integrated set of assays that can be used to monitor a mix of functional changes that occur with a cell population during a bioprocessing event. For example, SELDI-TOF or MALDI-TOF can be used to analyze the proteomic profiles of cells subjected to different preservation regimes; whereas genomic profiles can be measured using cDNA microarrays. 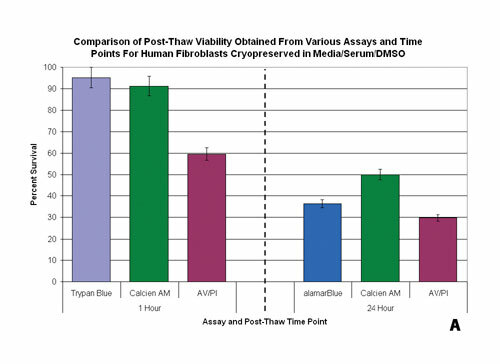 An example of this is seen in Figure 3A where cells were cryopreserved using a conventional procedure of cell culture media supplemented with 5% DMSO (M5) or CryoStor CS5 (BioLife Solutions). Previous reports have demonstrated that Tier 1, 2, and 3 assays indicate that cells stored in CS5 are more viable and functional than those stored in M5. The use of proteomic analysis (SELDI-TOF) demonstrated that even within cells surviving the cryopreservation process there can be significantly altered proteomic fingerprints. If such a viability/ functional fingerprint can be identified, then this type of analysis may improve our ability to assess stem cells and engineered tissues utilized for regenerative medicine. One critical component to consider is the timing of the assessment relative to the perceived objective of the assay. In the assessment of preservation efficacy, measures of viability are typically taken immediately poststorage using Tier 1 assays such as Trypan Blue or Calcein-AM. At this time point, Tier 1 assays typically yield high degrees of viability. Yet, when the same population is probed with the same assay system after 24 hours of culture, the viability can be compromised (Figure 3B). As with Tier 1 assays, the time in which Tier 2 assays are applied can significantly affect the interpretation of the data. With the Tier 2 assays of apoptosis, it is important for an initial time course (i.e., 1, 4, 8, 12, 24 hours) analysis to be performed. As a rule of thumb, the 4–8 hour interval is generally most appropriate for looking at poststorage apoptosis and necrosis levels and the 24-hour time point is most appropriate to evaluate true cell survival poststorage. The choice of viability and functionality assays is crucial to the future of the effectiveness of procedures and processes utilizing preserved cells. The proper selection of assays is not merely of academic importance given that some assays do not reveal delayed-onset cell death and loss of function. A multitiered assessment regime may guide future discussions as we move forward with improving and optimizing all aspects of cell processing for use in the therapeutic and basic research applications.